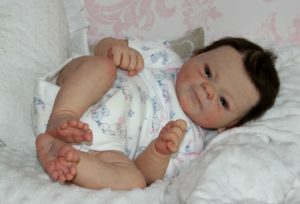 This gorgeous realborn baby girl is currently for sale on eBay. She is such a beautiful baby and will enhance any collection. All details were from the eBay listing. You can find the link to the eBay listing of this baby at the bottom of the page. 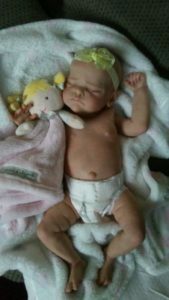 This little girl is THE FIRST Realborn® DOWN SYNDROME Baby!!! Welcome to my auction for sweet little Patience (or a name of your choice). Please contact me before bidding if you have less than 5 feedback. 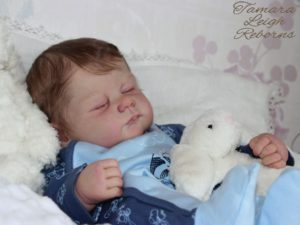 Patience is a prototype and has been expertly reborned from the gorgeous new REALBORN® sculpt ‘PATIENCE AWAKE’ from BOUNTIFUL BABY. A huge thank you to Bountiful Baby for giving me the opprtunity to bring this beautiful sculpt to life! Patience has the most beautiful face and gorgeous full limbs. She is a perfect little girl to dress and cuddle. She also comes with a gendered tummy plate. 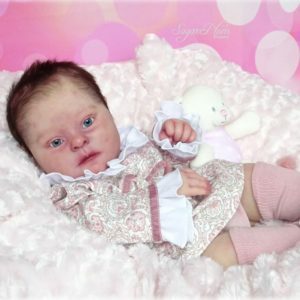 She has the most gorgeous newborn skin tones with milk spots and baby blemishes – just like a real baby! She has beautifully rooted dark chocolate brown Delta Dawn hair and complements her skin colour perfectly. Her hair is swirled and slightly thicker at the crown and finer towards the face. It is very true to life 🙂 It is finely painted underneath and directionally micro-rooted so very easy to comb back into place after dressing her. 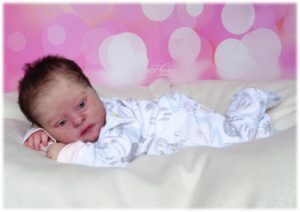 She has true to life skin tones, veining and mottling, all painted with Genesis heat set paints and she is sealed with my unique blend to give a slightly textured but soft feel. She has finely rooted eyelashes. She has the most realistic glass eyes – these eyes are the most realistic I have ever seen! Nostrils have been opened and backed. Weighted using quality materials ~ extra finely ground glass granules, ‘baby fat’ balls, stainless steel shot and quality fibre fill. Patience will come home to you with all the clothing shown in the photographs. She is a true pleasure to dress with her full limbs!! Beautiful summer pants and a blouse.